Lumiere & Neopaque - Lustrous Lumiere metallic paint covers well and adds dazzle to fabric, leather, paper and wood. Opaque, highly pigmented Neopaque paints are designed to cover dark grounds. 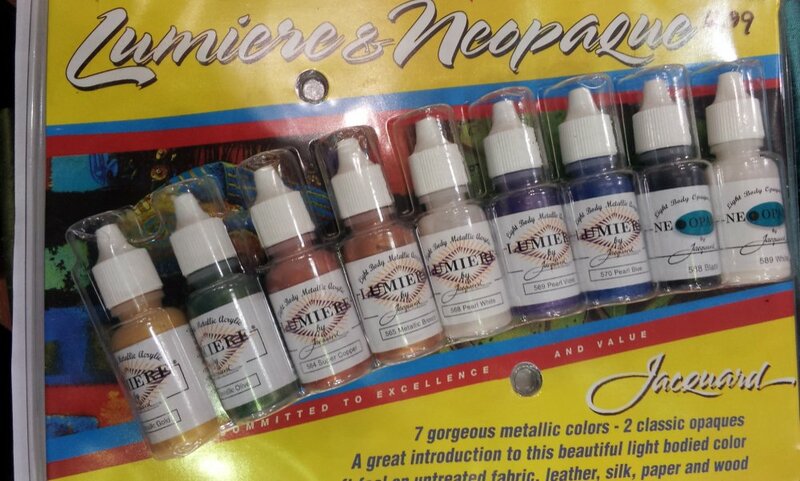 Includes nine 1/2 fl oz./14 ml squeeze bottles with the following colors: Lumiere Metallic paint (gold, olive green, copper, bronze, pearlescent white, pearlescent violet and pearlescent blue) and 2 colors of Neopaque paint (black and white).